Posted: October 14, 2014 | Author: thelondoncolumn | Filed under: Amusements, Churches, Entertainment, Theatrical London | Tags: English humour, Hawksmoor churches, John Claridge, Museum of Comedy, St. George's Bloomsbury, Tommy Cooper | Comments Off on Tommy Cooper. Tommy Cooper, Thames Television Studios, 1967. Photo © John Claridge. It’s all for you, isn’t it, Tommy? All the time – even offstage – you’re thinking: how can I get noticed? How can I get a gag out of this? You’d piss in the gutter to make a drain laugh, wouldn’t you? You’d shoot your granny for half a titter. You leave that gutter out of this. These lines are a characteristic interchange from the two eponymous comics in my play Frankie and Tommy. Frankie is my dad aged 23, as I re-imagined him. His oppo is none other than Tommy Cooper. The play tells the story of their brief and ill-fated double-act, entertaining the troops in Cairo in 1946. It was commissioned by John Godber for the 21st anniversary of Hull Truck Theatre Company, and premiered at the Edinburgh Festival in 1992. It caused a bit of a stir. I didn’t see my play as an exposé of a celebrity so much as a bitter-sweet Everyman tale about lost opportunities and faded dreams. For me, the story was a universal one about the shadow cast over youthful illusions by a brief, fleeting brush with true genius. It was about lost opportunity, and coming to terms with one’s failures and mediocrity. The play is like a variety show Amadeus, with my dad as Salieri and Cooper as Mozart. It’s as much a professional tribute to Cooper’s stage brilliance as it is an unveiling of Cooper the man. It was an attempt to show the fez-wearing buffoon in all his perfectionist complexity, an artist in whom emotional inadequacy was the spur that drove his hyper-nervous and shambolically skilful act – an act full of fumbled magic tricks and painful wordplay acting as armour-plated defence mechanisms from too much inquiry into the inner self. The invented dialogue of Frankie and Tommy – which owes a lot to Morecambe and Wise, Barker and Corbett and similar duos – is full of puns and evasions in which Cooper constantly undercuts a serious point with a wisecrack or non sequitur. It’s the technique of the inveterate joker who can’t bear to face reality, yet in dodging it not only makes us laugh but often presents us with an even more profound truth. Perhaps, in the end, that is the enduring force of Cooper’s humour. He wasn’t, as some have claimed, the first ‘alternative comedian’. There was nothing politically anti-establishment about his mainstream, commercial television style. But it was certainly subversive in the way it used ineptitude as comic strategy, satirising the empty slickness of much light entertainment and reminding us that at heart we’re all fools within. … for The London Column. © Garry Lyons 2011. 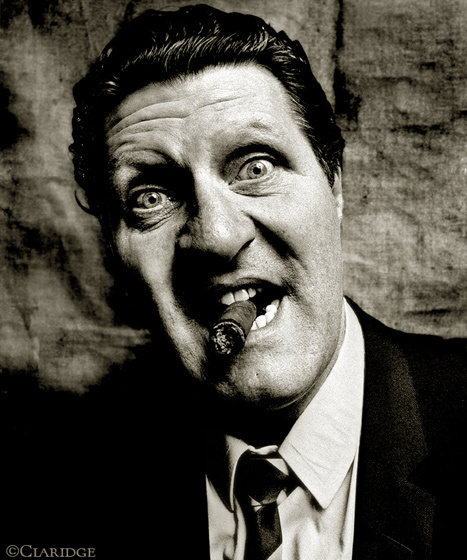 This post appeared on The London Column in 2011; we are reposting it as John Claridge’s photos of Tommy Cooper are currently showing in the auditorium of the Museum of Comedy, implausibly located the crypt of Hawksmoor’s St.George’s, Bloomsbury. Museum of Comedy, The Undercroft, St Georges Church, Bloomsbury Way, WC1A 2SR (open Tuesday – Sunday 12pm – 5pm).